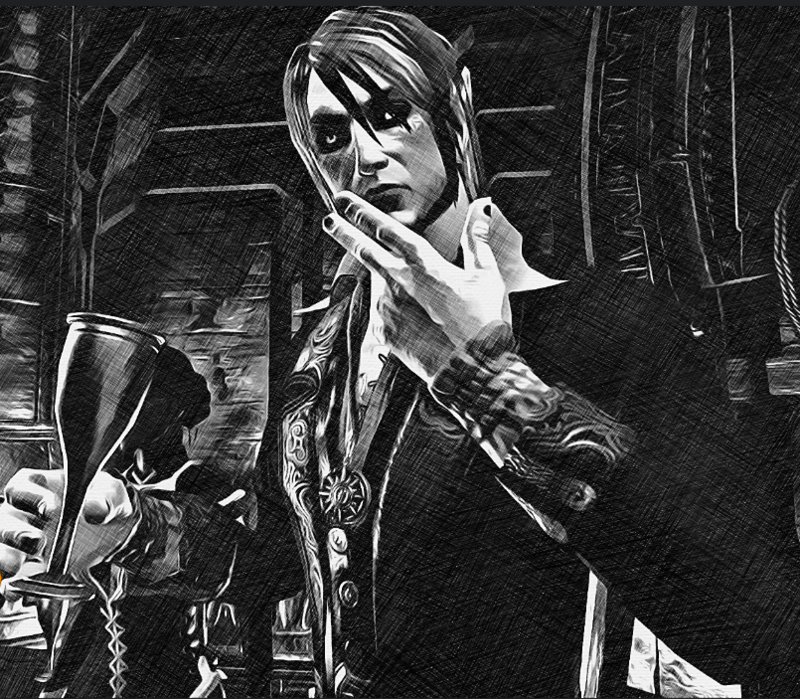 The Altmer suffers from a rather rapid degeneration into the stage of his vampirism; his longevity on Nirn only calling more attention to the fact that he has completely changed into a creature of the night; one of Molog Bal's insidious images. One would recommend he have an appointment with the sun for the mer is rather pale in all forms of light. He could be confused as albino if not for the rather settled pallor of his eyes. Eyes that are stark white as snow with a darkened pupil at their center. A strange look for an altmer but he seems to not mind the staring, the questions. The mer modestly contains most of his appearance with ornate armaments, make and styling of outdated Altmeri craftmanship. The armor he wears seems overtly ornate to suggest that it is purely for show; begging the question if the Mer truly knows how to wield the powers that are at his disposal. For in his recreational periods, he is much more oft to donning fine silks and tunics that are befitting of his station within a house of nobility. Ralorian has lived to see most of his own family and friends fade away with the passage of time. His last living relative operates a trade stand in Firsthold, Auridon. The two have not met for Ralorian would find it jarring to approach the man to speak on his ancestry. One whom continues to elude him is the vampire that had cursed the mer in the first place; one of a Haarvenu line by the simple name of Ducal. Ralorian continues to pursue this individual, until recently. A period of recuperation in Wrothgar with his longtime ally, Garat gro-Bargol, proved to be fruitful. A hideaway was found that was owned by Ducal in which Ralorian finally was able to settle old grievances in a manner befitting the justice of his family. Ralorian entrusted Garat with a great reward for assisting him, giving him knowledge into the mer's secret affairs and bestowing upon him the power that would create all the indications of a thrall. The orc is anything but: more a trusted friend and confidant that Ralorian places much faith in for his diligence, wit, and prowess. Ralorian is versed in a rather archaic style of Altmeri mannerisms and customs. His speech is rather deliberate and concise, valuing insights into research, politics, and rhetoric. He is a rather pensive elven male that rarely does anything for spontaneous reasons. His humor can be rather dry, at times, and the dominance of Altmer dynasties and eras past have made an impression on the status this mer holds himself to. His actions are, in his perspective, not to be called into question. As an elder vampire, he believes he is beyond reproach even though he has never truly spent enough time to facilitate such a worldview with his own kind. Recent events he had experienced in Summerset and Wrothgar has steeled him to some of the crassness he had displayed before making the journey. While he recovered, his isolation and indifference to a love gone awry created a sense of abyssal loneliness that festered. It was only at the adherence of his friend, Garat, that he was able to pull himself out of a rather dismal spiral. Ralorian tends to style himself in rather ornate clothing when he is not roaming about the lands of High Rock and Valenwood abroad. His armament styling is akin to what old Altmer would fashion themselves in with metallic hues of pale moon and shining silver. At first, it appears ostentatious but there is not one individual in the surrounding hamlets of Daggerfall that cannot recognize the shining, staff-wielding "knight" that has been plunging their villages out of debt and bandit ire. The Altmer is rather skilled in the school of Destruction magic, powered by his affliction with the ability to weave lightning and fire to his whim to create devastating storms of burning electrical currents. He is not beyond the Altmeri school of blademanship; sporting a dual-bladed battlestaff that is equally able to fling and conjure spells just as readily as it can cut through assailants. Ralorian onced served his people proud in taking the trip from the greater Summerset Isles to idyllic Auridon with the intentions of serving as a financier to one Canonreeve Ulsion. The canonreeve instructed his new financier in all matters of political, financial, social, and general practices of serving a greater nation. Ralorian was a steadfast confidant of the Canonreeve; a position that his family was also grateful for. It was not long that Ralorian's daughter was also beginning to reap the fruit of their labors, courting various patrons and traders that would seek to increase the family's gains from business deals of Ralorian's. His daughter met with an ill fate; becoming the puppet of the vampire Ducal, which enacted in Ralorian a sense of purpose to wrest his daughter from the clutches of such a vile creature. In a masterful game of wit and deception, the mer was able to bargain for his daughter's soul: an exchange. The plan was sound and the contract complete but Ducal was not so forthcoming in his intentions. Ralorian's daughter was expunged before him; Ducal playing his hand as the master manipulator and left Ralorian alone to grieve on both fronts, for his daughter and his new curse. Ralorian stayed at a distance from his family; always watching from afar as his other children grew to acquire families, his wife to move on without him, and time to eventually forget him. Recently, the Altmer's plans in his homeland of Summerset went awry in more ways than one. The labors of time and the nature of his malaise created a vacuum of power to which a dastardly adversary was able to overpower the would-be noble, rendering him devoid of sustenance and a means to keep himself whole. With the assistance of his friend and ally Garat gro-Bargol, Ralorian managed to recover and rejuvenate in the frosty plains of Wrothgar. It was a lengthy process to which almost claimed the mer's will to continue on after the injuries he suffered. Loneliness from isolation and the rigors of the deaths pressed upon him throughout his time as a vampire weighed heavy. The pang still carries over even if he has managed to create a sense of purpose again as he returns to his former employer.